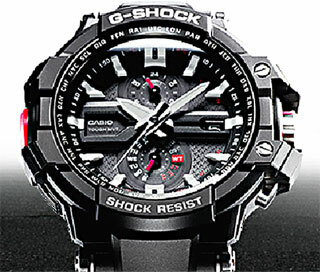 Casio extends it’s high end G-Shock product by adding GW-A1000 to the American catalog. Jump to check out the other new “Aviation” models. 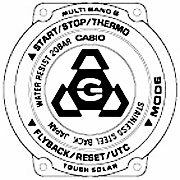 Press Release from Casio America: DOVER, NJ, (August 9, 2012) — “Casio America Inc. seamlessly combines advanced timepiece technology with high performance functionality in the new G-Shock G-Aviation, GW-A1000. Preserving the G-Aviation legacy, this new chronograph possesses a cockpit inspired display with a large case analog dial featuring white accents and Triple G Resist Structure. Triple G Resist Structure is designed to withstand the shock of three forces; gravitational dropping force, centrifugal gravitational force and vibration. The GW-A1000 also features Multi-Band 6 Atomic Timekeeping, enabling Self-Adjusting of time and date by automatically syncing the watch to any of the 6 regions’ atomic towers base on the wearer’s home city setting. More Aviation watches, videos and descriptions can be viewed by clicking here. “The new GW-A1000 is the first G-Shock to come with “Smart Access,” making the watch’s functions smoother than ever with an electronic crown switch and five-motor drive. The wearer can easily select the time in different cities around the world and with just a simple press of the switch, move between home time and world time, or instantly display Coordinated Universal Time (UTC). Since the hour, minute, and second hands, are driven by separate motors, the hands respond quickly when the wearer resets or starts the stopwatch, or switches between different time displays. “Smart Access” enables convenient, simple operation of the watch’s wide range of features, including a “fly-back” function that allows the stopwatch to be instantly reset and start during operation as well as instant temperature display at the press of a button. “Impeccably designed with toughness and technology as its primary attributes, the G-Aviation also incorporates other features including, tough movement, thermometer, 1/20th second chronograph (120 min), countdown timer (60 min), shock resistant, 200M water resistant, tough solar power, world time (29 cities + UTC), daily alarm, 12/24hr dial and date display. This video by watchtanaka.com shows operation of this watch and the odd use of the crown – you can’t help but chuckle when you see the second hand ticking backwards in the countdown mode. Click here to view larger photographs of this new model. Four GWA1000 models are shown here: they all have the same timekeeping features. The first (described above) and second which have been designated for world wide distribution differ only slightly in the coloration of some small detailing and the “D” model (at 68,000 yen, the most expensive G-Avaitor yet) comes with a black IP steel bracelet. Special thanks to watch-tanaka.com for the video above. The “RAF” model is a special edition (packaging) commerating the Royal Air Force and the “A-1A” is a new colorway announced for release in the Japanese Domestic Market. The GW-3500B-1A2 and the GW4000-1A2 are new colorways of existing series that are also slated for the Japanese marketplace. The GW4000-1A and the GW4000D-1A (titanium case and bracelet) are included because they’re recently available in the USA. And if you think this post is confusing to read, imagine what I went through compiling it. Casio is responding to the phenomenal explosion of interest in the Aviation series by trying out lots of different feature sets, colorways and price tiers.